“Blue Skies Over Darwin” is the title of this painting by Troy White, showing an RAAF Spitfire Mk. VIII in full glory over the blue Australian coast. 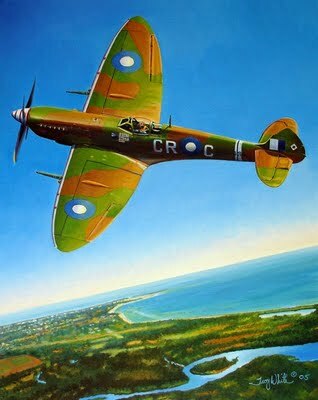 Notably, this is not just any Spitfire, but A58-484 flown by W/Cdr Clive R. Caldwell. Caldwell was the highest scoring Australian fihter pilot of WWII; his awards include the DSO, DFC & Bar and the Polish Cross of Valour.